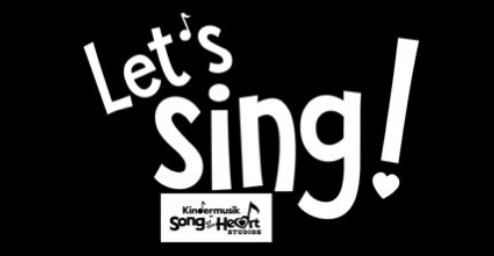 You may have noticed our new “Let’s Sing!” initiative in our studio. We have always encouraged you and your little ones to sing along with us during our classes, but sometimes it’s easy to forget to participate in this most fundamental way. We get it. Not everyone feels confident singing. Sometimes it’s easier to let the educator take the lead, and enjoy class in a more passive way. Maybe you’re intimidated by the other strong voices in your class. Whatever barriers might exist that make you feel less inclined to sing, we want to remind you of the reasons why singing along is so beneficial! Your voice is your child’s FAVORITE voice. No one sounds quite like mom, dad, grandma, or nanny. A child’s primary caregiver is their source of comfort and security, and a huge part of that is familiarity with your voice. Not your child’s primary caregiver? Singing to them is an extremely effective way to build the same level of bonding and attachment that they have with their primary caregiver, making the time that you care for them that much more effective and easy. As mentioned before, ATTACHMENT with a child or infant is super-charged when you add singing. Lullabies and playful songs promote eye contact, intentional touch, and build connection. And as we know from Conscious Discipline research, “connection builds cooperation”. Don’t miss out on this easy way to connect with your child. Teach your child by EXAMPLE. Want your child to gain the language development benefits that come from singing along? Show them how. Want your child’s brain to light up in all developmental areas? Encourage them to sing by singing yourself! Want your child to develop the pro-social group behaviors that come from collective singing? Lead the way. They won’t learn how to exercise their voices if you aren’t using yours. It’s FUN. As delightful as our Kindermusik classes are designed to be, you can make it that much more of a special experience by adding your voice to ours. A whole choir of families engaged in musical play and learning is such a beautiful sound! No matter your vocal ability, Kindermusik is a safe place to use your first and most basic instrument. Your voice is a huge part of who you are. And you are welcome here, just as you are. Whether you have classical vocal training or none at all. Whether you’ve got vocal confidence or none at all. Where else can you let your inner child out to play and be completely safe? Kindermusik isn’t just a safe environment for your child, it’s a safe place for YOU. We invite you to throw those inhibitions out the door, tuck those cell phones back in your bags, and be fully present, both physically and vocally, with your child when in our studio.